Company culture is more important than ever. You want to create an environment that people want to be a part of and want to contribute to. Company culture has the power to motivate or frustrate employees so getting it right is essential – it is especially important to get it right within the world of recruitment where we see a direct correlation between culture and environment with success. 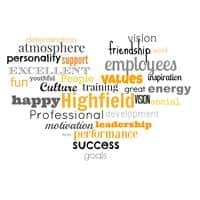 Highfield Professional Solutions have been around for ten years now and we believe over time we have established a great company culture! So what’s the most important thing in getting that great culture within the work place? People! In order to succeed you need to get the right people, with the right attitude and the right behaviours and allow them to contribute. We value staff opinions. If your staff believe that they truly matter, and that their opinions matter, then the company is sure to soar. We conduct annual anonymous surveys, where staff can pitch ideas, and tell us how to improve. Here at Highfield we have a strong vision and we make sure we communicate that vision throughout the company, ensuring everyone is after the same end goal. We know that when an employee is on board with the mission, they’re engaged in the job and want to help achieve it. We rely and support each other as team to make sure we uphold it and continually grow. If you’re not talking to your staff, how do you know if they’re happy or not? We conduct regular one to ones and catch up meetings to ensure all employees are feeling valued and have all the support they need to succeed. With such strong leadership it is hard not to succeed at Highfield. Working directly with Directors and managers we make sure all consultants receive the best advice and support possible. There is a friendly, relaxed and supportive atmosphere within Highfield. Whether it’s helping each other out, or spending lunch breaks beating each other at table tennis, everyone encourages each other to do well. Team nights out and after work drinks are a big part of our culture. We believe that success and hard work should be acknowledged and rewarded; we are always organising the next event such as the races or award ceremonies.